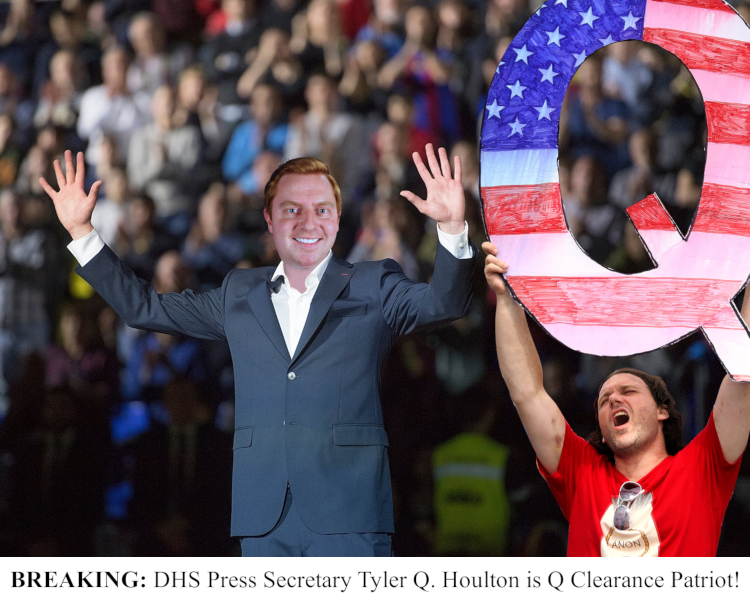 In a shocking press conference this morning, DHS Press Secretary Tyler Q. Houlton revealed that he is the anonymous “Q” who has been promoting conspiracy theories online. In 2018, an anonymous individual going by “Q Clearance Patriot” started posting in online forums claiming to hold classified information about a “deep state” conspiring against Donald Trump. The conspiracy theories have fueled a growing horde of paranoid online followers. Security Debrief asked Q whether there were other deep state secrets to share. Former FEMA Administrator Brock Long was using agency vehicles to visit FEMA camps holding aliens from Alpha Centauri. He resigned because the aliens want Michael Avenatti to lead U.S. disaster management. CBP Commissioner Kevin McAleenan is the love child of former CBP Commissioner Gil Kerlikowske and RoboCop. In an effort to grow the ranks of his agency, ICE Director Thomas Homan has secretly adopted 32,000 unaccompanied minors and is raising them to become ICE agents. TSA Administrator David Pekoske is considered by the deep state to be too competent and will soon be sent to a North Korean concentration camp, the same fate that befell his predecessor, Peter Neffenger. USCIS Director L. Francis Cissna is using biometric exit-tracking to scan the population for vaccinations and has teamed with the Air Force to use jet contrails to spray health-harming smallpox vaccines. Coast Guard Commandant Adm. Karl L. Schultz is lobbying Congress not to fund new icebreakers because he is himself a polar bear and the ships scare away the seals. Robert S. Mueller III was kidnapped in 2017 and taken to the Nazi Moon base while an advanced Mueller costume was designed for First Lady Melania Trump, who impersonated the former special council. This explains her infrequent public appearances and “Mueller’s” two-year silence. 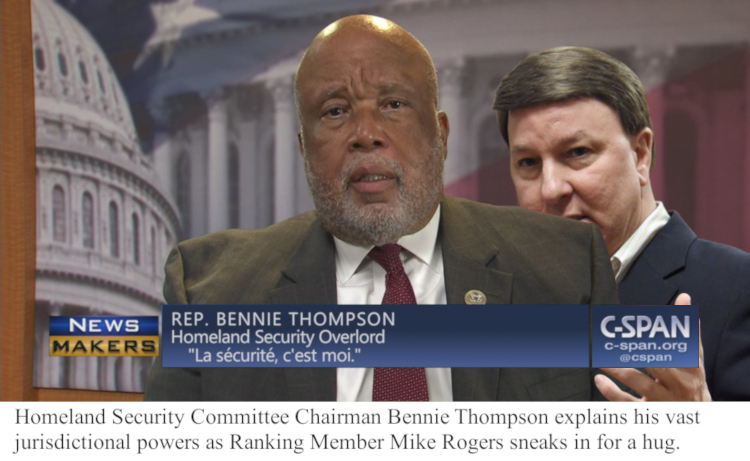 After enduring years of frustration from sharing DHS oversight jurisdiction with more than 80 other congressional committees and subcommittees, Committee Chairman Rep. Bennie Thompson (D-MS) seized complete jurisdiction over DHS and all of its component agencies using a little known, and barely understood, provision in House Rule MMXIX (4)(i), which gives the chairman of a standing committee “the ability to assert primary and exclusive jurisdiction over an issue if the House Parliamentarian does not file a written objection to such request within 20 days from the date a written inquiry from such chairman is sent to the Parliamentarian.” Thompson mailed a hand-written letter to temporary House Parliamentarian, Henry Martyn Roberts VI, late in the evening of February 15th ahead of the Presidents’ Day holiday. The letter claiming jurisdiction over all DHS activities had to undergo chemical and biological agent eradication using high-intensity irradiation before it could be delivered. Because the previous 35 day partial federal government shutdown affected the mail processing facility in rural Pennsylvania, Thompson’s letter was not marked “received” by the Parliamentarian’s office until March 5. By the time Mr. Roberts ruled on Thompson’s request, 25 days had elapsed and under the House Rules it had become effective. Admitting exhaustion from so many resolutions denouncing hate, Speaker of the House Nancy Pelosi today announced the creation of a new Intolerance Caucus and assigned representatives to it. The founding members of the Caucus are Reps. Steve King (R-IA) and Ilhan Omar (D-MN). 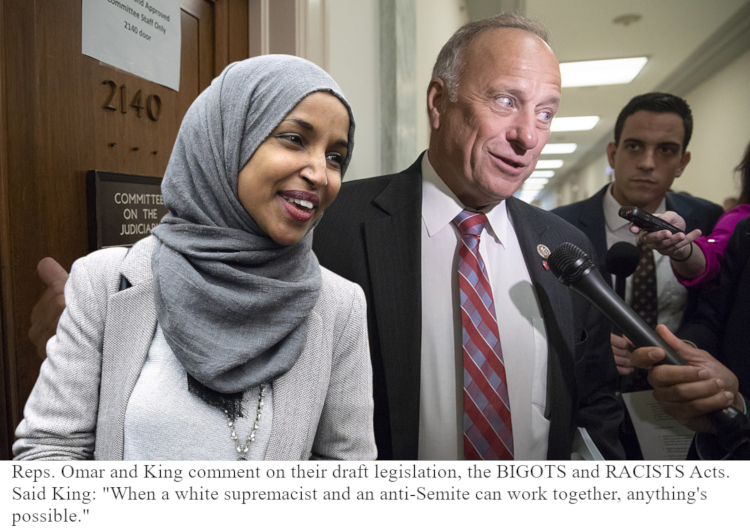 King is best known for championing his white nationalist beliefs, while Omar gained notoriety for her anti-Semitic code speak. King and Omar said they are working on several bipartisan bills and are seeking co-sponsors from members of the Homeland Security Committee. King’s “Recommending All Caucasian Immigrants So They Stay (RACISTS) Act” prioritizes immigrant visas for individuals based on the percentage of European heritage, as measured by melanin levels. Meanwhile, Omar’s “Beware Israel Getting Other Types of Supporters (BIGOTS) Act” expands laws against terrorist financing to target anyone who has ever donated to a Jewish organization, seen a map of Israel, or watched a Natalie Portman movie. Virginia Governor Ralph Northam of “blackface” fame sent a formal congratulations and invited King and Omar to the governor’s mansion for a celebratory dinner and private screening of The Birth of a Nation. 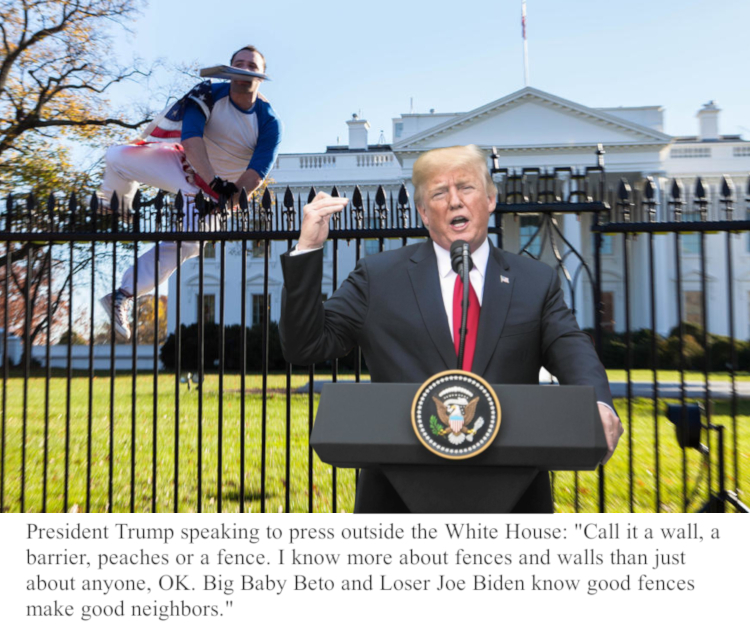 In an early morning tweet barrage, President Trump embraced a new report from the Robert Frost Fence Institute listing examples over the past 80 years of locations in each state where “good fences make good neighbors.” The report, released to the public today, was edited by G. Ima Builder, the retired executive director of the National Association of Fence and Wall Constructors of America and the poet laureate emeritus of East Berlin Township, PA. Entitled, “Fences, Walls and Other Barriers Key to US Good Neighbor Policy,” the report is filled with pictures, architectural renderings, and four-color graphics of barrier systems in every state, annotated with positive comments about better neighborly relationships. “Frost Fence Institute report confirms I am RIGHT. Walls work. Fences work. Barriers work. Crooked Hillary does NOT WORK! MS-13 Lover Nancy Pelosi has NEVER WORKED! Fantastic Fences WORK to create GOOD (not BAD) NEIGHBORS. MAGA by putting Americans to work! Build the big, beautiful wall NOW! 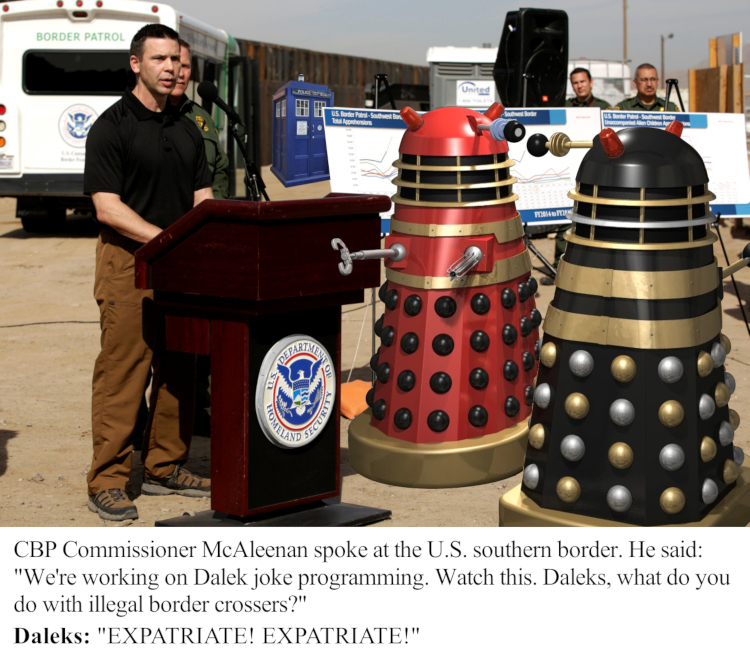 CBP Commissioner Kevin McAleenan announced today he has been instructed by the president to enter into a year-long R&D project with the BBC to deploy “up to 150 Daleks” along the U.S.-Mexico border. Reporters were told this refers to the ruthless extermination units featured on the Dr. Who TV show. “Since I was little, my father told me about the amazing technologies used by Dr. Who. I know time travel is possible, mostly because of the adventures through space and time of Dr. Who. Now we get to deploy a battalion of Daleks to help us address border challenges. McAleenan acknowledged that CBP has a significant need for additional field agents. Recent congressional hearings highlighted problems with hiring, with GAO investigators finding the average time to hire is about 318 days—and less than 3% of applicants are hired. McAleenan expressed confidence that the Dalek deployment would provide stop-gap coverage in areas where it is difficult for human officers to patrol. In advance of her new book, former DHS Secretary Janet Napolitano has been hitting the media circuit. She is promoting her new product line, the Napolitano Empty-Talk 3000 Translator, providing regular demonstrations of the technology’s capabilities. The Secretary fitted the device over her mouth. The device rattled, sparks flew and a wisp of smoke trailed up. We asked the Secretary if she had any other public figures using her product. 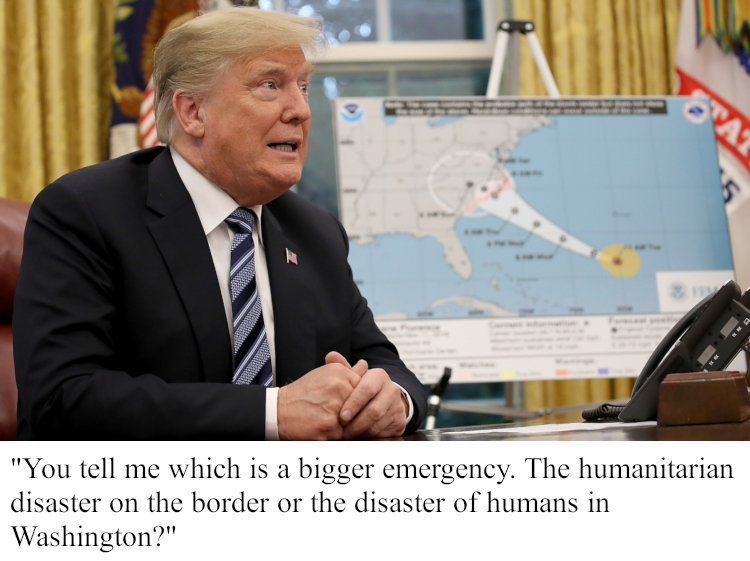 President Trump has issued an Emergency Disaster Declaration for an area described as “the 1400 acres deeded by Daniel Carroll of Duddington, the nephew of Daniel Carroll of Upper Marlboro, MD, to the US Government in the late 18th Century.” Otherwise known as Capitol Hill. Editor’s Note: This one is true. Serendipity is hilarious. 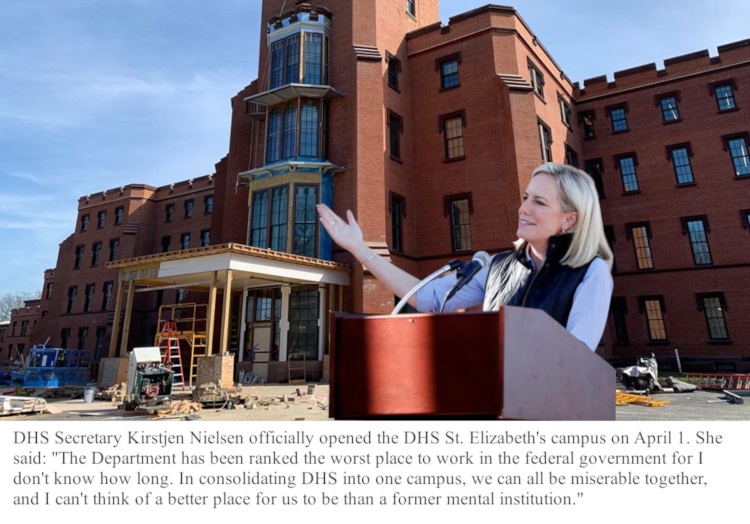 On April 1, 2019, the first group of DHS headquarters staff moved into the Center Building on the western side of St. Elizabeth’s Hospital Campus in Southeast, Washington, DC. The DHS HQ staff joins the U.S. Coast Guard headquarters as tenants. St. Elizabeth’s is best known for being one of the oldest and most prominent treatment facilities for mentally ill patients in America. While a small facility remains on the main campus, GSA has spent the past decade renovating other portions of the pre-Civil War facility, which was originally known as the Government Hospital for the Insane. 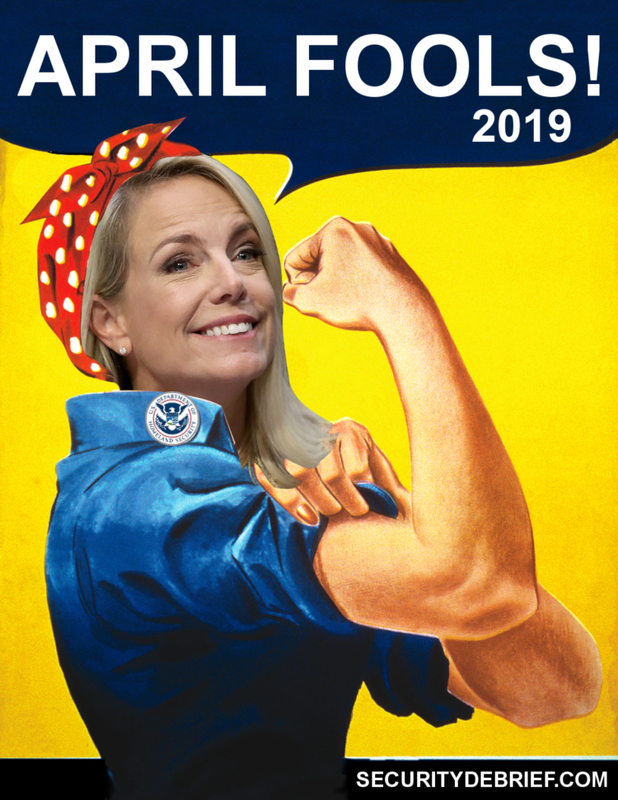 How did the Homeland Security Secretary win such a coveted award? Announcing news of the award, a DHS Press Office release also introduced a new initiative, the Caring And Good Enclosure (CAGE) Program, designed to address the challenge of caring for minors who are apprehended at the U.S. southern border. Having already peppered the DHS press office on a variety of absurd topics, Sec. Nielsen finally agreed to speak with Security Debrief. SD: Madam Secretary, let’s talk cages. Nielsen: The Department does not use cages or cage-like structures, as defined by some Congressional Research Service findings, and we don’t not use them to contain not-adults not at the border. What’s more, there has never not been a policy of un-separating separated persons who were apprehended at the border. SD: How would you define a cage, Madam? Nielsen: Something about this big [Sec. uses arms to indicate a small space], and there are dogs in it. SD: And the images from border facilities showing children in what are clearly cages? SD: So a long-existing wire-mesh enclosure with room to sit and stand is no longer a cage? Nielsen: Well, where do we draw the line? I mean, defining ‘cage’ has confounded philosophers for centuries. This is no simple matter. If you think about it, a fence can be a wall, a policy can be a law, and a cage can be just about anything we want it to be. That’s why I’m so proud of our new, more palatable CAGE program. It was created specifically to contain not-adults in a welcoming environment, where the terrors of their journey are not compounded by the indifference of the wealthiest, most powerful state in history. SD: CAGE is the best we can do? Nielsen: It goes to show, where there’s a will, there’s a way. DHS Cyber Security Division (CSD) employees identified the hack by special codes written into the bottom right-hand corner of the screen with the letters RDM, the name of a clandestine hacker group known as the “Russian Defense Ministry.” They told Security Debrief the exploit was eerily reminiscent of a proposed S&T cyber challenge for high school students that had been advocated by former S&T CSD Director Doug Maughan but previously rejected by CISA Director Chris Krebs in what was viewed internally as a continuation of a contentious power struggle over who would be the cyber lead within the Department. Maughan was one of the most publicly-visible S&T Division heads, something that often rankled former NPPD (now CISA) cyber focals who, according to Maughan’s former CSD co-workers, was fueled by jealousy that he actually accomplished things and was not hampered by DHS processes. CISA employees say that Maughan was very opinionated and that CISA cyber expertise was never fully appreciated, expressing relief that he is now at the National Science Foundation. Neither Maughan nor Krebs were available for comment but Ima X.Hacker, a retired NSA cyber forensic expert, told Security Debrief that the RDM exploit was akin to giving a “big middle finger” to DHS. “It is obviously a play on the highly-touted CDM (Continuous Diagnostics and Mitigation) program that DHS forces on other agencies but fails to apply to itself,” Hacker said. “DHS does not practice what it preaches and this is a perfect way of showing it to the world,” he continued. “Doug’s Division almost had their research budget stolen by CISA last year but Congress intervened and stopped it. I doubt Doug perpetrated this stunt as a parting gift to S&T, but whoever did it has a great sense of irony. RDM, after all, could be read as a message to ‘Remember Doug Maughan’ much in the same way that Texans ‘Remember the Alamo,’” Hacker speculated. Ten years ago, Chris Battle, David Olive, Rich Cooper and I had lunch at Off the Record in the Hay Adams across from the White House. A confederacy of wiseasses with cheeseburgers and a blog, who could say who said it first, but at some point, the idea of an April Fools edition was born. On this decennial, we’re barely as funny as we set out to be—and usually by accident. 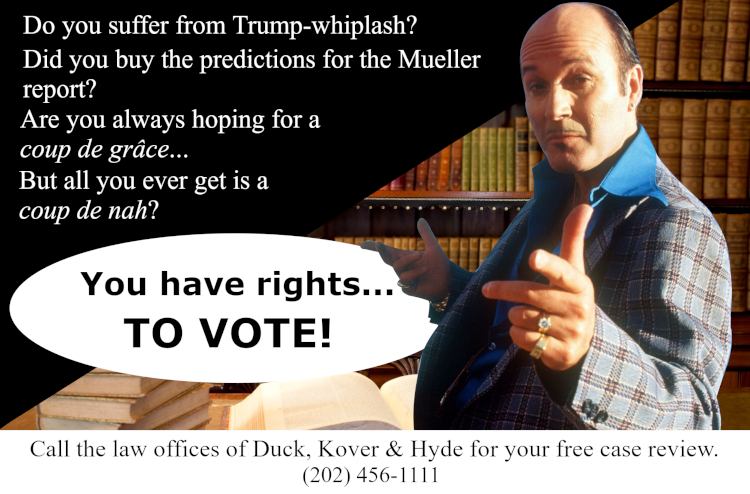 As always, very deep thoughts and as always on April 1, very funny and smart! No AI will ever produce anything close. Unless… trained by the esteemed group of authors.